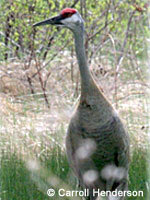 Early records suggest that sandhill cranes (Grus canadensis) were common residents south and west of Minnesota's forested region until the mid-1870's. Ecologically speaking, cranes employ a "slow" life-history strategy: they are long-lived, defer breeding for several years after fledging, exhibit very low reproductive rates and experience high annual survival. As a result, crane populations are more vulnerable to exploitation than species exhibiting "faster" life histories. Therefore, it's not surprising that rapid human expansion in the 1880's and settlement of Minnesota's prairie region resulted in the extirpation of cranes in much of their former range. Once common, the sandhill crane was considered rare by 1900 and it has been estimated that only 10-25 pairs were nesting in Minnesota in the mid-1940's. Since then sandhill crane populations have made a steady, if not rapid, recovery (Status and Distribution of Sandhill Cranes in Minnesota, 1985; Birds of North America No. 31, 1992). The recent distribution of sandhill cranes in the state consists of two separate populations, both of the greater subspecies: cranes in northwest Minnesota belong to the mid-continent population while those in central and east-central Minnesota belong to the eastern population. 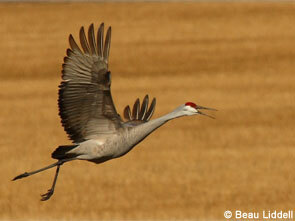 Crane populations will continue to expand throughout the state over the coming decades. The highest densities are expected along the transition zone between Minnesota's forest and prairie regions where wetland densities are high and upland habitats are dominated by agriculture. The current population size within the state is unknown, and a monitoring program is needed to track long-term population trends. Eastern population cranes that breed in Minnesota winter in north and central Florida, and mid-continent cranes from northwestern Minnesota winter along the Gulf-coast of Texas. Cranes generally return to their breeding areas from late-March through mid-April, and depart on their fall migration in early-September through mid-November. Resident cranes are impossible to differentiate from non-resident cranes during migration periods. In central and east-central Minnesota, nesting habitat consists of lowland emergent marshes and meadows dominated by sedges and grasses, often with stands of phragmites, cattails, bulrush, and wild rice occurring in deeper water in larger basins. These lowland areas are interspersed with upland wooded ridges, open prairie knolls, oak savannahs and agricultural fields. Suitable breeding habitat can include any shallow, flow-through or isolated wetland adjacent to open, upland foraging areas. In areas with healthy crane populations and low availability of breeding territories, large non-breeding flocks (50-200 individuals) seek out large, disturbance-free shallow wetlands with soft bottoms and open shorelines as roosting sites. These non-breeding flocks often remain in the local area throughout the growing season. Staging fall migrants feed in agricultural fields, primarily small grains and waste corn. Concentrations of fall migrants in the northwest can cause severe depredation problems, especially during wet autumns when farmers are unable to harvest swaths before September. Principal crops affected are wheat, oats, barley and rye. Spring damage to emergent small grains has also been reported. In central and east-central Minnesota most depredation by cranes occurs on sprouting corn, and has been documented around the Little Falls area since the late-1980's. This damage is limited to the first 14-17 days of growth, when gymnosperm is available in the seed, and usually involves minor losses of up to 1 acre adjacent to individual crane breeding territories. However, more severe losses (up to 40 acres) to non-breeding flocks of 25-100 cranes have been documented up to 15 miles from roosting sites. As the crane population continues to expand, prevalence and severity of damage, and increased demand for depredation control should be expected. Various measures have been utilized to reduce agricultural damage with limited success. Propane exploders, helium kites, flagging, scarecrows, scare balloons, and pyrotechnic scare devices, if successful, tend to relocate feeding cranes to another location. A combination of scare and harassment techniques along with lure crops may provide some temporary relief, and success often requires significant effort (sometimes annually if cropping patterns remain unchanged) since cranes become easily habituated to hazing. However, hazing is essentially the only practical option for growers in emergency situations. In 2006 through 2009 the United States Environmental Protection Agency granted temporary approval for the use of the non-lethal crane repellant Avipel®, formerly known as Avitec™, and applications for long-term use of Avipel® are being pursued for future planting seasons. Avipel® has an active ingredient of 9,10 Anthraquinone (AQ), a naturally occurring substance used by plants to deter bird foraging on seeds and fruits, and is marketed in liquid and powder forms. Cranes detect AQ at very low levels and avoid it. Growers can use either formulation to treat seed corn themselves, or can obtain pre-treated seed corn from distributors. The powder formulation is placed directly into the seed box at the time of planting, while the liquid form involves treatment of the seed corn prior to planting. Seed correctly treated with the liquid form is the most effective for damage control with 100% aversion. Powder treatment is more variable, particularly if other slicking agents are used during planting, but can be expected to reduce damage by 50-70%. Cranes will still be observed foraging for waste grain and larval insects (particularly beetle larvae) in treated fields but will not probe for corn. This benefits the farmer because waste corn and many types of beetle larvae can later cause problems as the crop matures. Cost of Avipel® treatment is about $5.00/acre and is expected to drop in the coming years. Based upon initial planting investment (typically at least $200/acre for corn), and relatively high corn prices, this level of treatment cost is well worth the investment to ensure crane depredation is eliminated. The cost to replant one acre due to crane depredation will exceed the total cost to treat a forty-acre field. Therefore, regardless of scale, treatment of seed is a cost-effective means of mitigating spring losses of a corn crop to cranes. If possible, plant crops other than corn within 1 mile of wet meadows and sedge wetlands; if this isn't possible, avoid planting corn directly adjacent to wetlands. Use the liquid form of Avipel® (obtain pre-treated seed corn if available to ensure proper treatment rate). If growers treat seed themselves, additional planning is necessary. This formulation provides the best protection. Add powder formulation of Avipel® to hopper at the time of planting if not using liquid formulation. Expect that some losses will still occur if using the powder formulation. Use multiple propane exploders, move daily and set to explode at random intervals. Visit field(s) frequently (at least once every 30 minutes), and haze birds regularly with cracker shells or similar scaring devices so cranes feel less secure and associate harassment with human presence. Cranes are protected by Federal and State law and may not be shot. For technical assistance, contact the U.S. Fish & Wildlife Service, Office of Migratory Bird Management Specialist at 612-713-5338 or your DNR Area Wildlife Manager (phone number can be found by contacting the DNR Information Center at 888-646-6367). For more information on the availability of Avipel®, growers should check with their current seed retailer, seed distributor, or call the Avipel® help line at 1-800-468-6324 (www.arkionls.com). Growers in Minnesota can also reach Dr. Eileen Cullen (UW-Extension) for more information on the use of Avipel® at (608) 261-1507.